Trade tokens, "good fors", bingles, scrip, chits, seco, whatever you call them, trade tokens have become a respected collectable, and an expanding branch of numismatics. The collecting of tokens, is called "exonumia", and includes other types of tokens, including transit tokens, encased cents, and many others. In a narrow sense, trade tokens are the "good for" tokens, issued by merchants. Generally they have a merchants name, sometimes a town and state, and also the required "good for 5¢" (or other denomination) legend somewhere on the token. Types of merchants that issued tokens include general stores, grocers, department stores, meat markets, drug stores, saloons, bars, taverns, barbers, coal mines, lumber mills, and many other businesses. Trade tokens are often made from aluminum, or brass. Some are seen in nickel, fiber, celluloid and vulcanite. The most desirable tokens have the town and state on the token. Many factors affect value of tokens, including if the town and state are on the token, the rarity, condition and type of business. Another important factor is the number of tokens known from the town. How can I find trade tokens to collect ? A good place to start, is with your friends and family. Let your friends know you collect trade tokens, and show them one, if they don't know what tokens look like. Carry a token around in you pocket for this purpose. Be sure and ask you family, aunts, uncles, grandparents, for any old tokens they might have. Other productive places to find tokens, are flea markets, garage sales, antique shops and malls, coin shows, coin shops, second hand stores, junk shops in small towns, metal detector hobbyists, and through trades and mail bid sales in token publications. What do tokens look like ? Tokens can vary widely in appearance, and there are many fakes, fantasy tokens and other poorly made copies, that are sold to unsuspecting collectors. Experience is the best guard against these fakes, but even the veteran collectors are taken by them now and then. Genuine trade tokens have a certain look about them, that you will become familiar with the more you handle them. Trade tokens discussed here were used generally between about 1867 and current day. We do not neglect post 1950 trade tokens as many of them are not only genuine trade tokens but quite interesting, affordable and attractive to the eye. This is merchant trade token from San Antonio, Texas. In this web site, we will reprint some of the articles that have appeared in various exonumia (token) and numismatic publications including the Tasmanian Numismatic Society Newsletter; "Talkin' Tokens" the monthly magazine of NTCA; the monthly news magazine of the American Israel Numismatic Association: "The Shekel"; the publication of the Numismatists of Wisconsin the N.O.W. 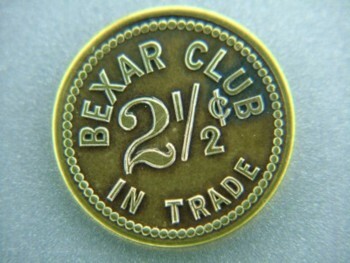 News; "Mint Luster" (Oklahoma Numismatic Association); Col. Walter Caldwell’s publication “Token Talk”; the publication of the Texas Numismatic Association “The TNA NEWS”; and "The Stockyard Collector". In addition there are also several articles that appear here for the first time. (The values shown for tokens in this website are estimated values, and are for information only, and not intended as an offer to buy or sell.) In addition Mr. Jerry Adams has done consultant work with authors on western history and provided photographs of tokens in his collection for Texas school books, as well as “Wild West” magazine (April 2008). page 46 -How did Ft. Worth become Panther City on Tokens & medals? page 56 - FANTASY & FAKE TOKENS !!!! Membership application to join the best token collector club in the world, NTCA! Who becomes a token collector ? Many metal detector users, coin collectors, historians, bottle diggers, contractors, police officers, teachers and others become token collectors. Some people collect tokens as related to their vocation, as the bus driver who collects transit tokens from different cities. Many coin collectors become token collectors, as they become more interested in the history of a certain area, or type of business. Token collecting combines the aesthetic appreciations of a coin collector with the study of the past that interests historians. email requests for permission for reprints may be sent to red13starwood@yahoo.com be sure include word TOKEN in header.. and please include your name, where you are located in the world (state if in the USA), and if you have a question about a token you found, you should let me know at least where it was found, the state for instance. I am not coming to dig tokens at your secret spot, but I can't identify a token if I don't have a clue where it was found. Free appraisals of tokens are NOT my business. However I am generally agreeable to give brief answers to token questions. Thanks! !